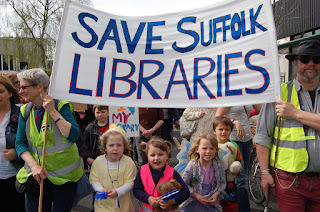 Saturday 2nd April saw hundreds of people take to the streets of Ipswich to march to Save Suffolk Libraries. People came from all over the county to join the march organised by Rosehill Readers against the planned "divestment" of library services by Suffolk County Council. This could see libraries closed or outsourced. There is still nearly a month to reply to Suffolk County Council's consultation just fill in Section 7 (What do you think about our overall proposals for the library service?) if you want to have your say but don't want to offer to run your local library! It's OK just to fill this part in. The consultation closes on 30th April. You might also want to complete section 1 (What library services do you want in future for your community?). If you like the services that are currently provided just say so! 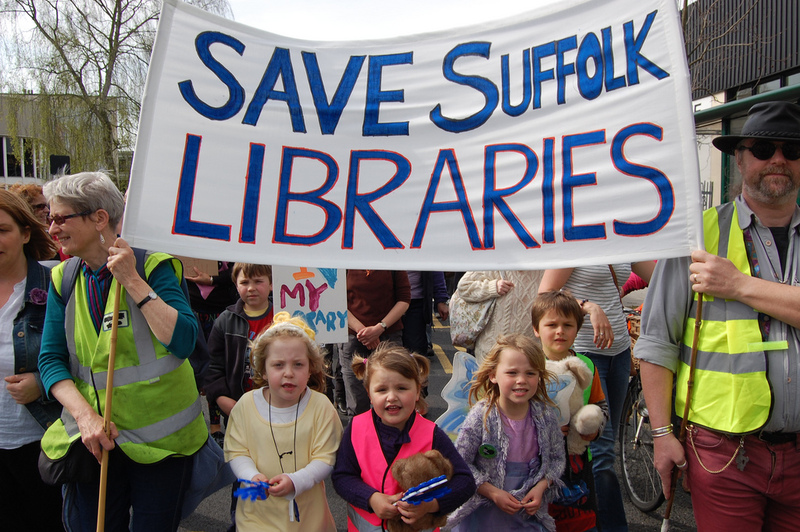 If you have't already signed a paper or online version of the Save All Suffolk Libraries petition and live, work or study in Suffolk please sign the petition now!